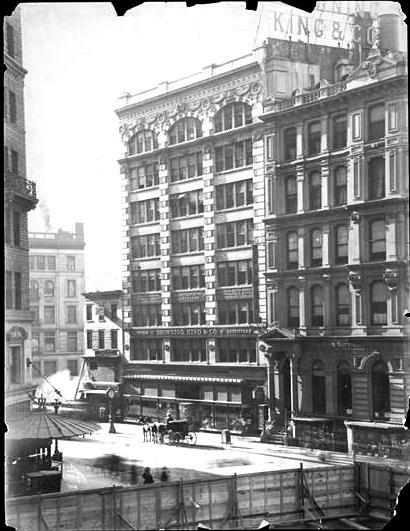 At the turn of the last century William R. H. Martin headed one of the most recognized men’s clothing shops in Manhattan: Rogers, Peet & Co. With his substantial fortune he invested heavily in real estate development. In 1900 he opened a massive high-end residential hotel on the northeast corner of 32nd Street and Broadway which he called home. It was only the beginning of Martin’s mark in the area. In 1908 he began the process of transforming nearly the entire block front between 31st and 32nd Street on the opposite side of Broadway. In August he broke ground for an 11-story store and loft building at the 31st Street corner; and within months began construction on an eight-story structure in the middle of the block where the former New York Times uptown branch office had been. The deep roundels on either side of the marvelous eagle announced B. K. & Co. The initials stood for one of William Martin’s retail adversaries, Browning, King & Co. Like Rogers Peet, its stores offered an extensive array of men’s furnishings—suits, shirts, hats and accessories. Well before the building was completed, it had signed a lease for the retail store. Its two-story storefront projected slightly out from the façade. The firm erected a tall electric sign on the roof at a cost of about $800 to announce its arrival. While Browning, King & Co. opened its doors to well-dressed male customers, the upper floors of the new building filled with many tenants involved in the construction business. Architect Simon Wisenberg was among the first to move in, and would be followed by architects Arthur Weiser, John Bagley Day, Samuel Geller, George H. Van Auken and William A. Hewlett. Builder and mason Leonard Schaler took space in 1910 and before long the Modern Fireproof Construction Company, “fireproof specialists,” was here. In 1912 builder and “alteration specialist” J. Schlesinger leased offices, as did Vogel Cabinet Co. which dealt in architectural woodwork. Tenants not connected with the building trade took space as well. Upon the building’s completion the Kraft Manufacturing Company took 2,000 square feet. The following year the United States Lithograph Company took an entire floor of 12,500 square feet, and the Magazine & Book Co. leased 11,000 square feet for its executive offices. 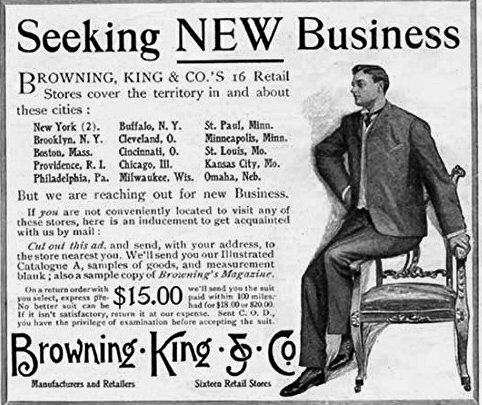 In the meantime, Browning, King & Co. dressed Broadway’s men in the latest fashions. The firm devised an ingenious method of increasing sales through employee incentives. A punch card system was introduced in 1919. Salesmen could choose among cards with 25, 50 or 100 punches. Every time a salesman from one department brought a customer to another, his card was punched. Every punch was worth 10 cents and when the card was filled, the salesmen would redeem it for the cash. The successful program resulted in cooperation between departments and additional sales. 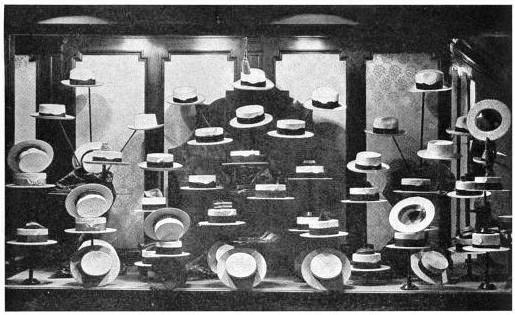 The vast selection available in the store was reflected in its hat department. Edwardian men were expected to wear the correct hat for the time of day, the season, the activity and the location. Summer straw hats included boaters, sailors and Panamas. There were bowlers, top hats, golf caps, felt hats, fur-felt hats, and on and on. The hats available at Browning, King & Co. were quality items. The least expensive hat in 1919 was $5 (almost $70 in 2015), with $8 hats far outselling those. Caps ran from between $3.50 to $4.00. One of these firms, operated by David M. Conn, ran afoul of the Federal Trade Commission in 1942 for its deceptive wording. On April 17 Conn agreed “that he will cease using in the advertising of his ‘Dr. McKenzie's Sanitary Health Sox’ the word "doctor" to imply that a physician is connected with their manufacture or the world ‘health’ to imply special health features,” as reported in The New York Times. Another tenant was in similar trouble a year later. The Belt Oil and Chemical Corporation marketed “Rubber-Life” and the FTC challenged the company’s boasts. On June 1, 1943 the Commission charged “that ‘Rubber-Life’ does not extend the life of a tire.” It would take a year to settle the matter. It was at about this time that the Olden Camera and Lens Company moved in. Starting small, by the end of the century Olden would be a significant presence in the building and establish itself as a virtual landmark in the Greeley Square area. In addition to being one of Manhattan’s foremost retailers of cameras, lenses and other photographic equipment; it staged photographic exhibitions and held instructional classes here. The ground floor space that had been Browning, King & Co. became Stewart’s Café in 1935. On the evening of August 19, 1949 Selden J. Small, president of an apparel manufacturing firm nearby at No. 1209 Broadway, stopped into the café. He would, at least temporarily, regret it. Many years earlier a wealthy theater owner, Harry K. Hecht, had sold Small a violin that he had purchased for his 14-year old son in 1929. Through what was apparently a good deal on the unwanted instrument, Hecht said he enjoyed “advantages” through Small’s apparel firm. But this was no ordinary violin. Created by master violin maker Carlo Giuseppe Testore in Milan, Italy, it dated to between 1750 and 1760. When Selden Small carried the violin into Stewart’s Café that night, its value was estimated at about $1,000 (nearly 10 times that much today). Small had taken the violin to his office because Irving Klase, concertmaster of Radio City Music Hall, had wanted to see it. Now, eager to spend the weekend with his family in the country, Small hurried out of the café, leaving the violin case behind. Luckily for Small, the night manger, Joseph B. Trester, found the instrument and turned it over to police. Detective work by Frank Leuci tracked down Small through a bill of sale in the case, which led him to Hecht, who barely remembered selling the violin to Small 16 years earlier. It was a complex process, “but Mr. Small took home his prize violin,” reported The Times. In 2008 the building was converted to apartments. The original two-story storefront was long ago removed and made flush with the property line. It was replaced by tawdry shops with neon signs. But above the abuse, Townsend, Steiner & Haskel’s brick and terra cotta design survives—including the never-noticed initials of its first tenant. You notice the brownstone building next door with the gigantic portico? Whoa.